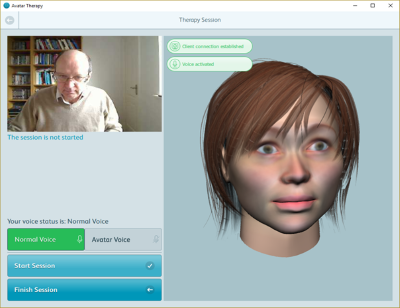 The UCL Avatar Therapy system comprises software for the delivery of Avatar Therapy for the treatment of Auditory Hallucinations in Schizophrenia by trained clinicians within a clinical environment. A description of Avatar Therapy can be found at avatartherapy.co.uk. The evaluation licence allows the user to download the UCL Avatar Therapy system for evaluation purposes only – that is, NOT for therapeutic use. Orders must be placed with an official institutional email address. Further details can be found at http://avatartherapy.co.uk/software. Craig, TKJ, Rus-Calafeel, M, Ward, T, Leff, JP, Huckvale, M, Howarth, E, Emsley, R, Garety, PA (23/11/2017). AVATAR therapy for auditory verbal hallucinations in people with psychosis: A single-blind, randomised controlled trial, The Lancet Psychiatry -, -. Evaluation licence for the UCL Avatar Therapy system. For evaluation purposes only, NOT for therapeutic use. The evaluation licence allows the user to download the UCL Avatar Therapy system for evaluation purposes only, NOT for therapeutic use.